Boards of Canada’s Tomorrow’s Harvest, reviewed. New electronic music that’s nostalgic for the sounds of the VHS era. 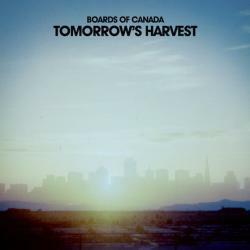 Boards of Canada’s new album Tomorrow’s Harvest. Tomorrow’s Harvest, Boards of Canada’s first album in eight years, sounds like the soundtrack for an impending slow apocalypse. The song titles speak of desolation—“Cold Earth,” “Sick Times,” “Reach for the Dead.” (Even the charmingly titled “Palace Posy” is an anagram for “Apocalypse.”) The album cover depicts a faded San Francisco skyline; the heavy lettering looks like coal, or blackish smoke. The album opens with a familiar sound: the triumphant, synthesized intro to a VHS tape from the early 1980s, its cheesiness re-created with exacting precision. As the intro swells, you almost have to chuckle: You can visualize a blue geometric pattern—perhaps a square—filling the screen, as the gritty pixelated text grows larger. Then, the music quickly becomes ominous, unsettling—a dark mood that continues for the rest of the album, as the music slowly unfurls in a grand, cinematic arc. Tomorrow’s Harvest is Boards of Canada’s most visually oriented album; it’s also one of their most cohesive. You can practically see the dystopian science fiction film playing in front of your eyes as you listen; you can traverse the cold, barren landscapes and smell the heavy air. Arpeggiated synthesizer patterns abound on this album, a vintage sonic signature that gives the music the whiff of various movie soundtracks from the late 1970s and early 1980s. Many electronic musicians over the past several years have revisited this particular trope, to the point where it feels overused. When the album started streaming on the Web, some wondered if Boards of Canada had lost its edge—whether the band that had generally managed to play with the past in ways that seemed timeless was finally beginning to sound dated. Others compared Tomorrow’s Harvest, rather unfavorably, to a late ‘70s Tangerine Dream record. Boards of Canada—the brothers Marcus Eoin and Michael Sandison—have now been around for nearly 20 years, practically granddads in the endlessly shifting landscape of electronic music. When their last album, 2005’s inspired but patchy The Campfire Headphase, came out, the vintage-inspired trends of “library music” and “hypnagogic pop” were in their infancy. More recent acts—such as Burial, Oneohtrix Point Never, and Ariel Pink, to name a few—have ventured into related sonic and emotional territories, conjuring a potent past that never quite existed. But Tomorrow’s Harvest is a grand achievement, and Boards of Canada have shown that they’re still very much a part of the present-day musical landscape. Played as a whole, the album sounds sweeping and epic; themes surface and resurface, giving Tomorrow’s Harvest its own internal rhythm. The album’s intricate design becomes more evident the more you listen. The heavy drones and hard arpeggiated patterns connect with subtle melodies and nuanced textures, atmospheres that sound as if they were tinted with a million different shades of black, green, gray, and maroon. Boards of Canada are masters at the power of suggestion, of helping the listener to see images with their music. Half-remembered memories, faded to a watercolor wash. Childhood in all its eerie, abundant mystery. Craggy landscapes covered in moss, in a beautiful place out in the country. The cover art (generally blurred and colorful) helps to create a picture, of course; the rich imagery and wordplay in the song helps, too. More important still is the music itself—the painstaking attention to how the sounds themselves are crafted, the narrative flow of each track to the next, and the analog artifacts that tie the music to a specific point in time. Think of the crackle of vinyl, the variable speed and hiss of tape. These things are not something tacked on at the end for character, a gauzy Instagram filter added to soften a hard digital surface. If there’s an ongoing theme in Boards of Canada’s music over the years, it’s a celebration of the beauty of imperfection, of slow deterioration. The concept of capturing a bygone moment and holding it in your hand as it slowly dissolves is central to Boards’ aesthetic, and a key to the music’s enduring emotional resonance. Everything about the band—from their heavy cloak of secrecy (the duo lives in rural Scotland and generally avoids playing live) to the moldering analog hardware they employ (“Everything we use is decrepit,” Sandison said in a recent interview with the Guardian)—is part and parcel of the mythos that the group has come to represent. A committed fan base picks apart every last reference buried in the music; a cryptic 20-second vinyl record recently released by the band for Record Store Day fetched $5,700 on eBay. But their music doesn’t just attract rabid collectors; it has wide appeal. Boards of Canada and Daft Punk sound nothing alike, but the two groups have a lot in common. Both groups have a very distinct sound, one that is immediately identifiable as their own. They’re both obsessed with careful recreations of specific analog sounds and eras, as Daft Punk demonstrated on its recent mega-’70s homage Random Access Memories. But no matter how entrenched in a specific concept they get, Daft Punk still sounds like Daft Punk, and Boards of Canada always sounds like Boards of Canada. As unrelentingly dark as most of Tomorrow’s Harvest is, there are moments where it’s hard not to smile. In “Palace Posy,” the mood steadily grows warmer, culminating in a cut-up vocal sample that sounds like it could have been ripped out of 1998’s Music Has the Right to Children. Boards of Canada—they’re just so … themselves. Despite the myriad directions that electronic music has gone since the 1990s, and the many who have matched—or perhaps exceeded—their vision, their music still has lasting power. No one sounds exactly like they do.